My husband and I are guilty of a serious Diet Coke addiction. We end up with a lot of these 44 oz. plastic cups from the convenience store. They come in handy as scoops and for carrying things around, but too many still end up in the trash can. When Kim at Seven Thirty Three asked me to write a tutorial, I decided I needed to find a new use for these cups. 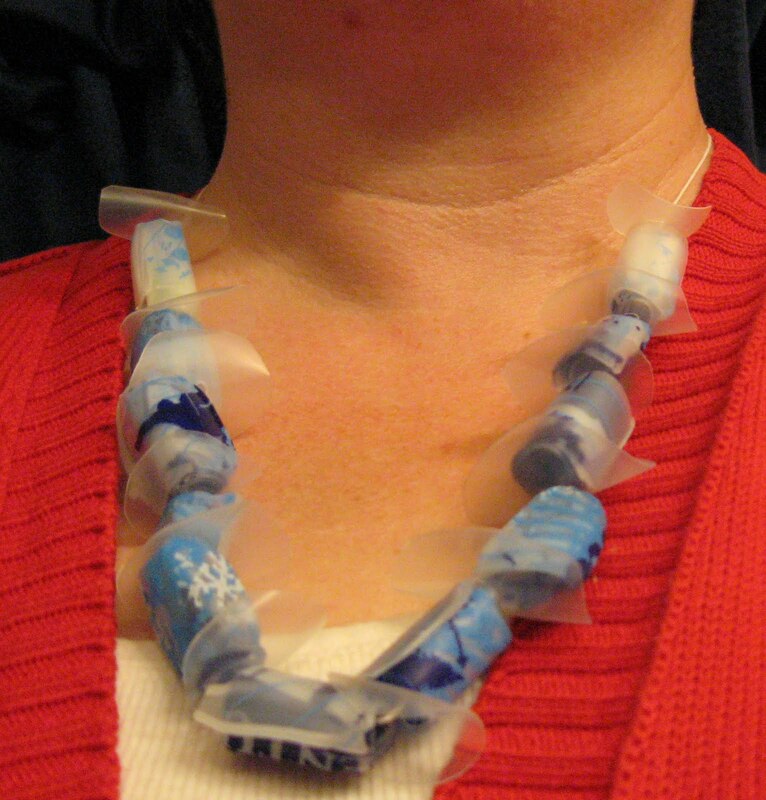 I remembered seeing a tutorial once where someone cut up plastic water bottles, colored them with markers, and then melted them to make beads. 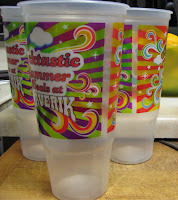 Since most of the cups we get are already pretty colorful, I thought the soda cups would be even better. 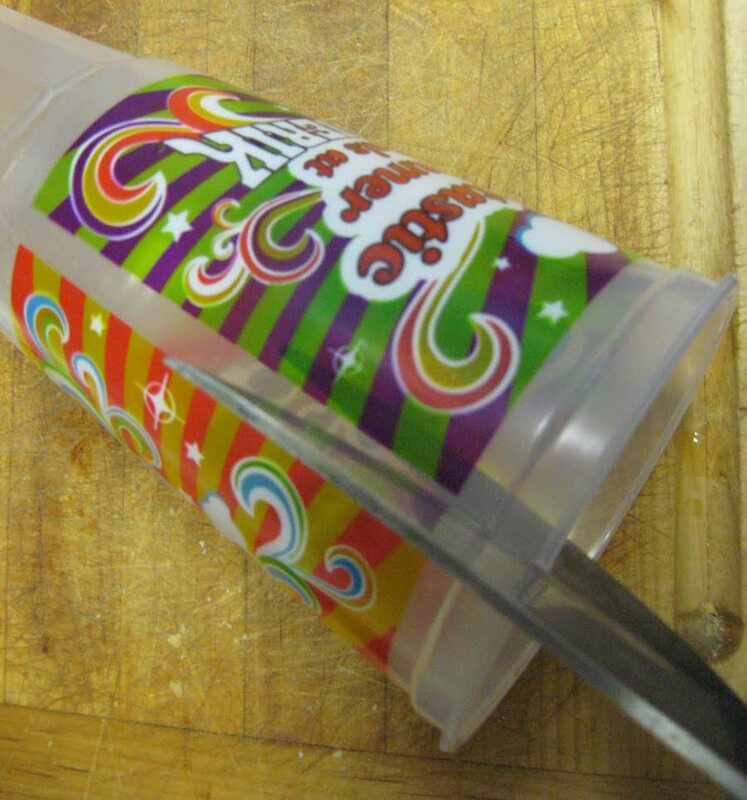 First, I cut down the cup to just the design area. Next, I cut the plastic into one inch strips. I just eyeballed it since I wasn't going for the beads to be exactly the same. 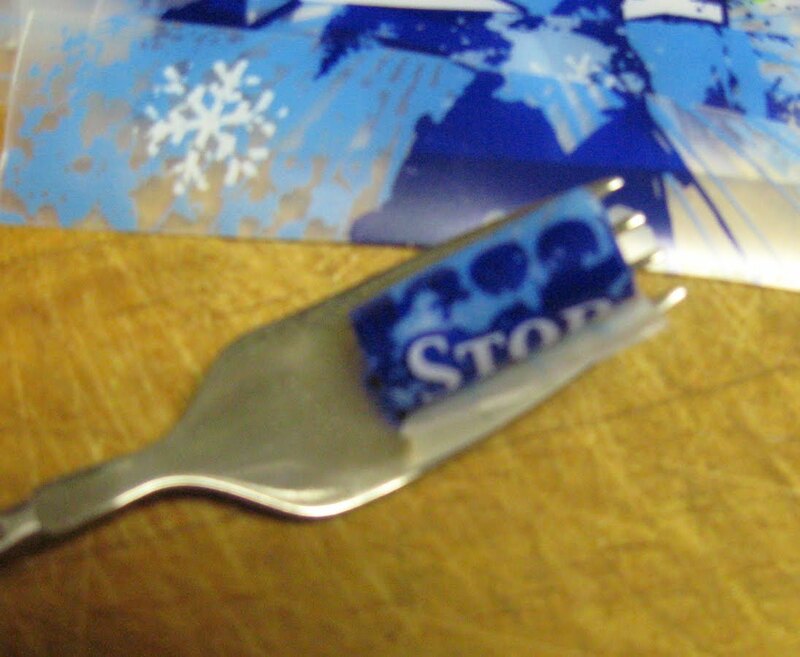 The next step was to roll each strip of plastic and stick it in the tines of a fork. You could use needle nose pliers to hold it, but I couldn't find mine. My sons have this telescoping handled fork that worked perfectly for this and the tines kept it from unrolling. With the electric stove burner on high, I held the rolled plastic over the burner, letting the plastic melt. 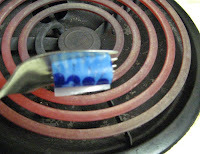 You will have to watch carefully so the plastic doesn't burn, but heats enough to melt the layers and hold them together. The original tutorial I saw used a heat gun. Please be careful with this step. 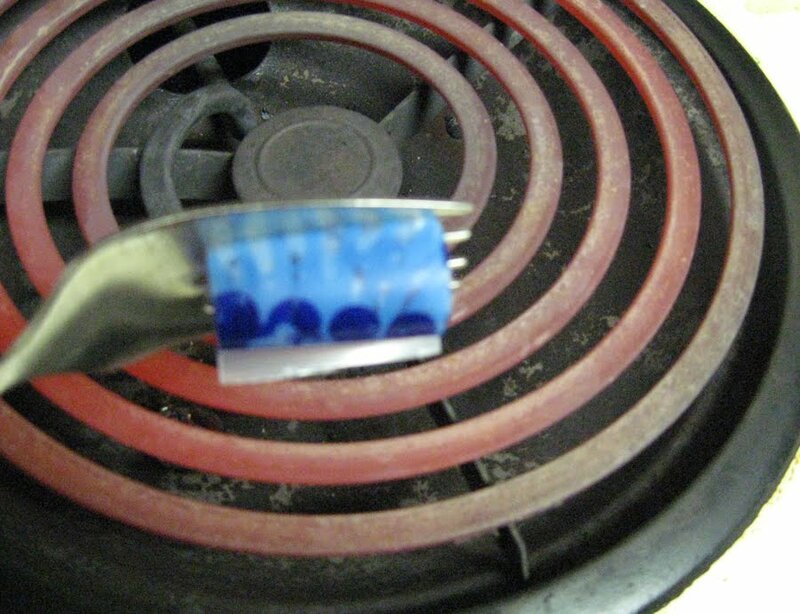 Stoves are hot and I'm relying on everyone to use common sense. 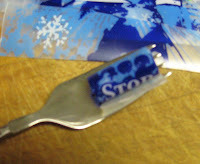 Carefully remove the bead from the fork (or pliers) and let cool. The color on the cups intensified when melted, so I'm happy with how they turned out. 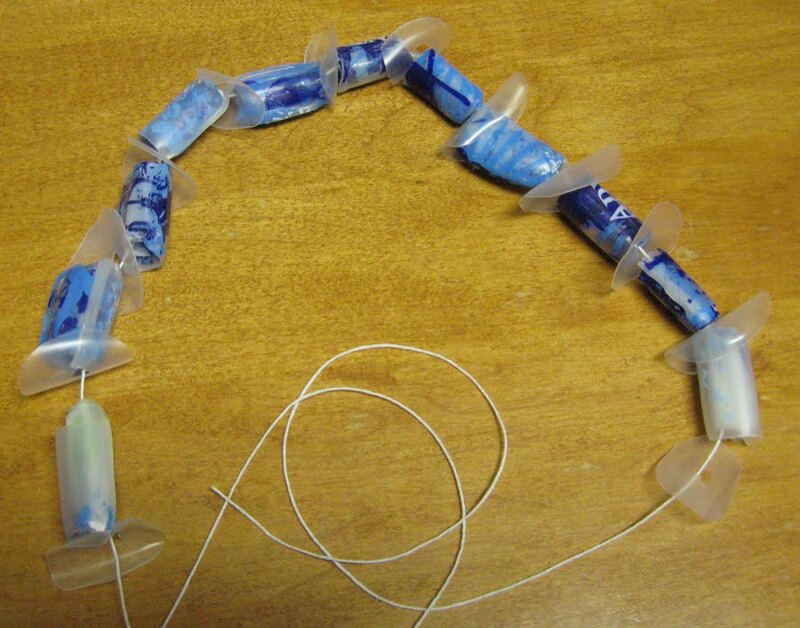 The next step was to string the beads together. 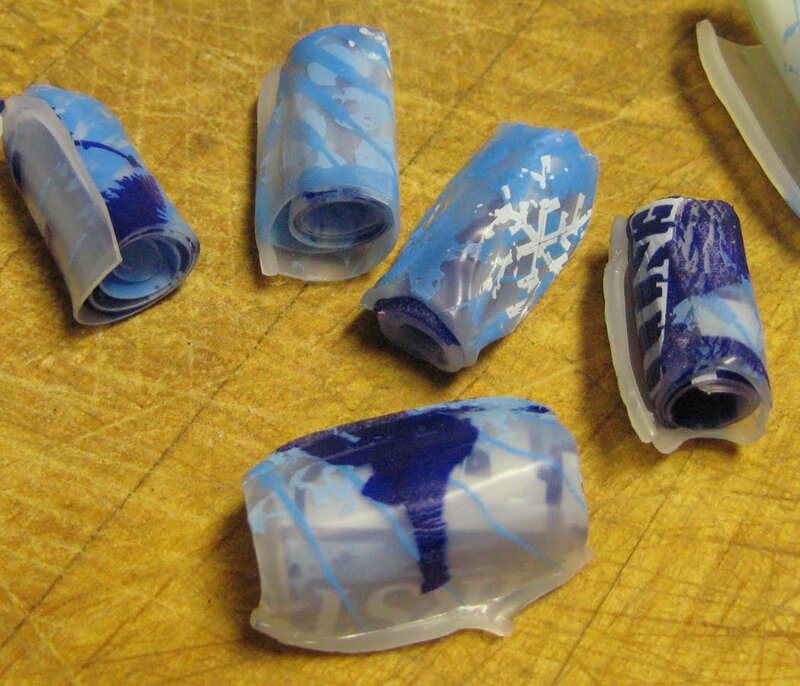 I had cut apart the clear part on the bottom half of the cup into small circles and punched holes in them. I set them on a cookie sheet in a warm oven to get them to curl up a bit. Those circles made nice spacers between the rolled up beads. I did this fairly quickly using one cup. If I had taken my time and used more cups, I could have had a less chunky look, but I like how they turned out. I'm going to continue to play with this idea and start using up my Diet Coke cups. It's a prettier way of taking care of the environment! Back at the beginning of this month, I mentioned that we purchased a Cricut Expression cutting machine. As much as I've wanted to post something about using it, I didn't have much to share until now. There's a bit of a learning curve with this new toy. Cutting different types of paper and vinyl take very different settings and I'm still learning how to set it up right. The cutting mat was losing it's stickiness and I found a wonderful post about using a particular kind of non-permanent glue in a 50/50 solution with water to coat the surface of the mat. Unfortunately, that special glue is sold out everywhere....even online! I did some more research and discovered that cleaning the mat with some rubbing alcohol would help a bit. 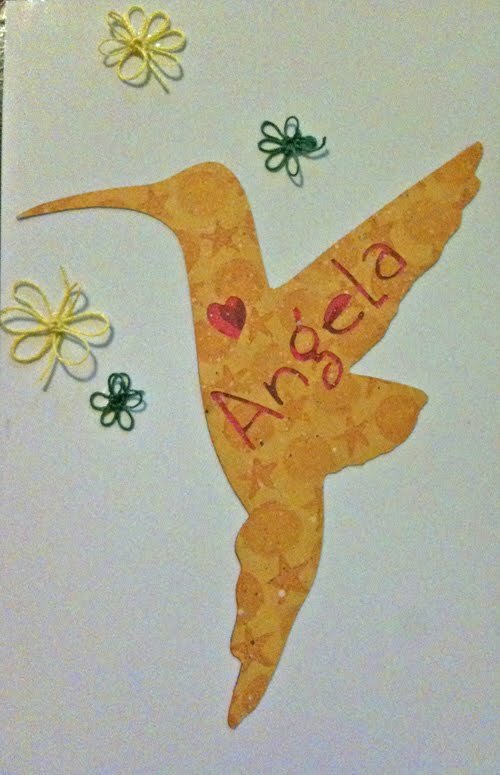 One of the items I created was this hummingbird. I did it in two layers so I could cut my friend's name and a heart out of the top layer. After gluing it to a card, I added some little tatted flowers. It made a nice gift when she was having a tough time last week. My husband has been doing some amazing artwork with Native American dancers. We have done some test runs with the art and have had to make a lot of adjustments to get better results. He is used to using finer detail, but the Cricut definitely has limits on what it can do. 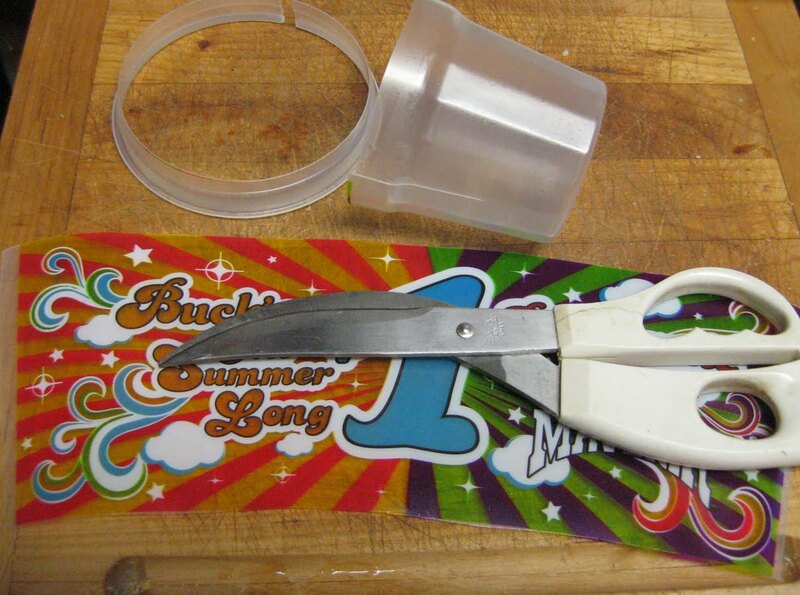 Giving it thin or tiny pieces to cut can result in ripped paper or vinyl. In some cases, we just had to widen things a bit or change a pointed end of a line to a blunt or rounded end. We are so glad we purchased the Sure Cuts a Lot software. There are no cartridges that can do the kind of amazing art my husband does. One finished project is now listed in our shop. 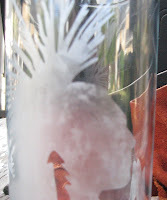 Hubby used the vinyl cut from his design as a stencil to etch a glass vase. An experiment with another piece turned into a framed piece of art. It will not end up on Etsy due to some problems I had along the way. I had purchased a picture frame from Ikea and went to place the vinyl design on it. I had removed some protective plastic from one side of the "glass" (plexi), but didn't notice there was plastic on the other side as well. Of course, that's where I applied the vinyl....disaster! I managed to put the transfer paper back on the vinyl and carefully peel it all back off, but the vinyl stretched some along the way. I got it back on the "glass," but it wasn't as smooth as it should have been. I put a sheet of metallic coated paper in the frame behind the design and it looks pretty good (from a distance). I'm excited about doing more of these designs. At work, we are having a Gala in October to raise money for scholarships and I will probably be using the Cricut to create some decorative items for that. 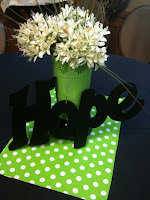 To help with the learning process, I've been following a lot of blogs about Cricut and paper crafting. Part of the reason I started this blog was to support and showcase my Etsy shop. 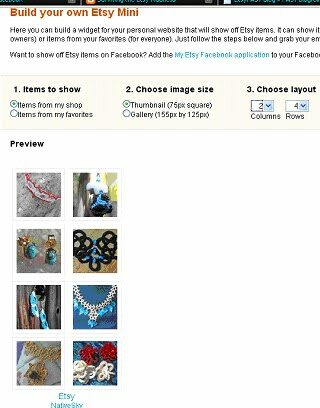 Originally, I used Ety's own Etsy Mini application to link to my shop. You can choose how tall and wide it will display and it shows them in order of how they show up in your shop. This app worked well enough, but didn't change what items were displayed unless you rearranged your shop or added new listings. Boring! 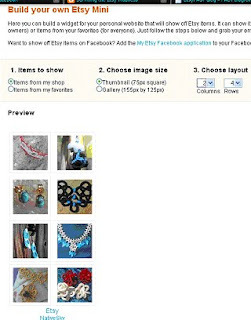 It's a good idea to look at the featured apps area on Etsy from time to time to see what's new. Craft Cult came out with a beautiful new widget for showcasing your shop. The Pocket Shop creates a slide show of all the items in your shop. You can choose the look of the widget and choose the order for the slide show. I absolutely love the look of The Pocket Shop and I believe I had a sale because of it this week. Someone who came to the blog to read about our featured Native American artisan saw something they liked in the slide show and clicked through to make the purchase. It was nice to be able to use a widget that coordinated better with my blog's look and I think the constant movement of the slide show catches people's attention. 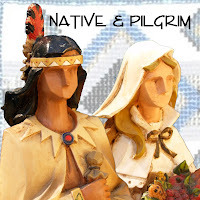 As my husband and I began our Etsy shop, we weren't really sure if Native American items would do well. I think we both thought of Etsy as more of an online craft boutique and, therefore, a home for "cute" arts and crafts. There is actually a substantial Native American community on Etsy and I was quickly befriended by Joni Stinson, a registered/enrolled member of the Muscogee Creek Nation, a U.S. Recognized Tribe. Since she's been on Etsy longer than I have, I wanted to find out what her experience had been. How did your shop get started? 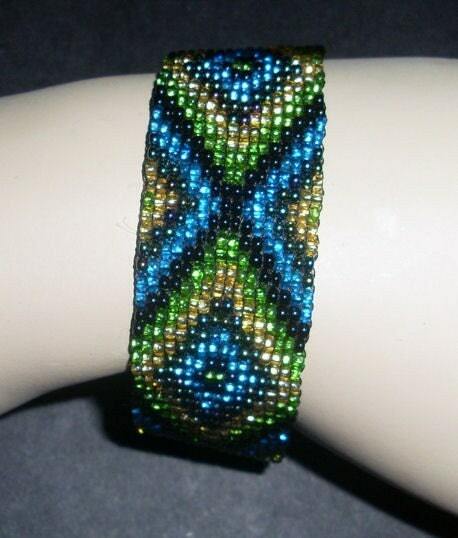 I joined Etsy in 2007 in order to purchase a beadweaving pattern from a local designer who was selling them on Etsy. 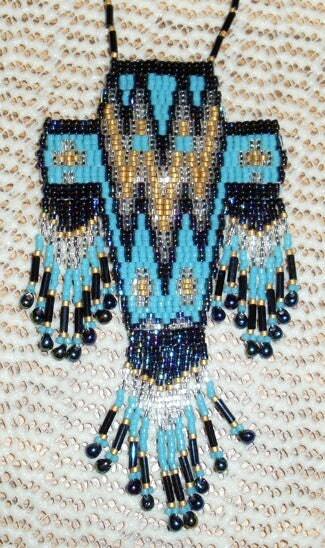 I enjoyed beading and was selling my work at two local galleries, area craft shows, and regional Pow Wows. At the time, it never crossed my mind to sell on Etsy. Having located Etsy following the designer’s instructions, I joined and was soon interested in “surfing” other locations and made a few purchases during the following year. Almost a year to the date, I decided to list a few things on Etsy to “test the waters”. I have been “testing” every since. Since then, my store has slowly but steadily grown . I have hundreds of items that I have yet to list on Etsy. My plan for the coming fall is to increase my items by at least 30%. I guess I would have to say that the thing I find most frustrating is the need to photograph my items. Jewelry is difficult to photograph even for professional photographers and I am certainly a novice! Not only does one spend a great deal of time with the photographic set up, then you have to upload, crop and sometimes adjust the photographs. That is followed by decisions as to which photographs are good enough to use and which to delete. Then it is time to upload them to the listing site. I admire those who are able to submit wonderful photographs. But taking the time to become a better photographer would cut into time I could be beading. I hope to find a balance that is of acceptable quality some day. Is your shop doing as well as you'd like? Of course everyone wants their business to do better! However, most of the year, Etsy is a secondary market for me. I love doing “live” events where one can interact with the buyers in a much more personal way. We begin events in late March and do not stop until October. I am sure that I could do better on Etsy if I had more items listed for sale and spent more time improving my marketing strategies. But I am satisfied for the present. What unique challenges do you face with being a Native American artisan? 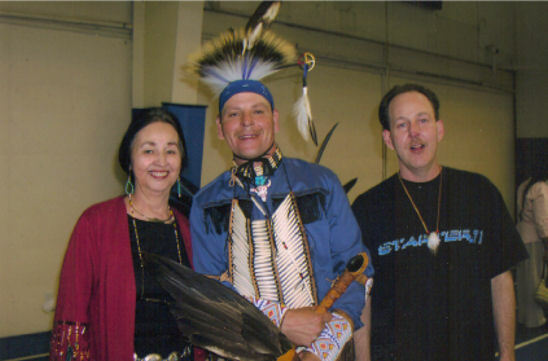 In order for one to promote an item as Native American or use the name of a Native American tribe in their title, they must be a registered member of a U.S. recognized tribe. One year ago, there were 5000+ items on Etsy tagged Native American. Today there are over 8000 items tagged Native American. I would estimate that as many as 2/3’s of these are not made by registered members of a U.S. recognized tribe. 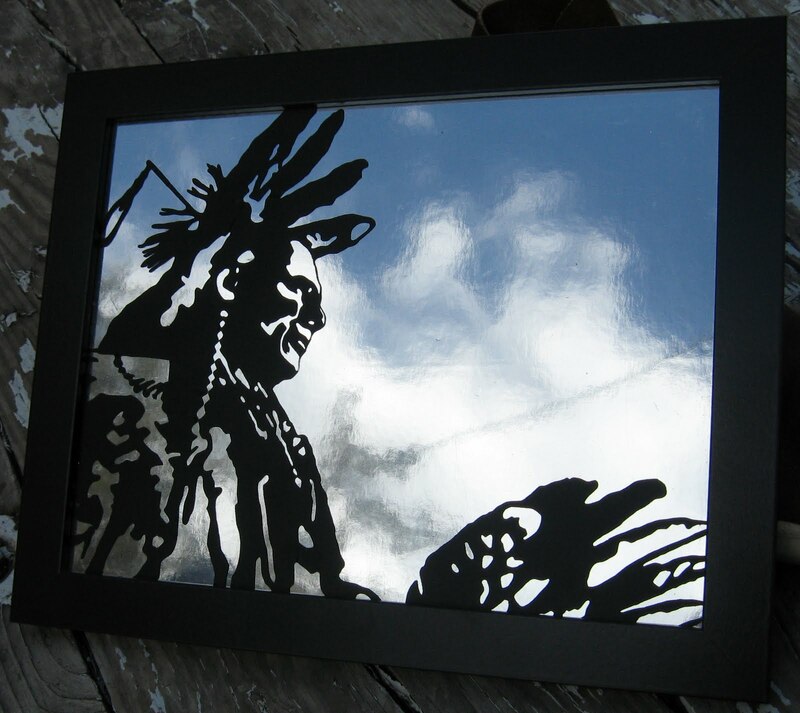 Buyers may think they are purchasing authentic Native American work when they are not. 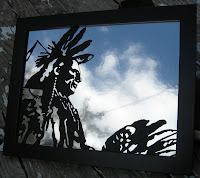 I have many friends on Etsy who do wonderful Native American Style work that are Native by blood but are not registered and others who are Native in spirit only. I have no problem with them as they promote their work as Native Style or Native Inspired. They make no attempt to promote it as authentic Native American work. 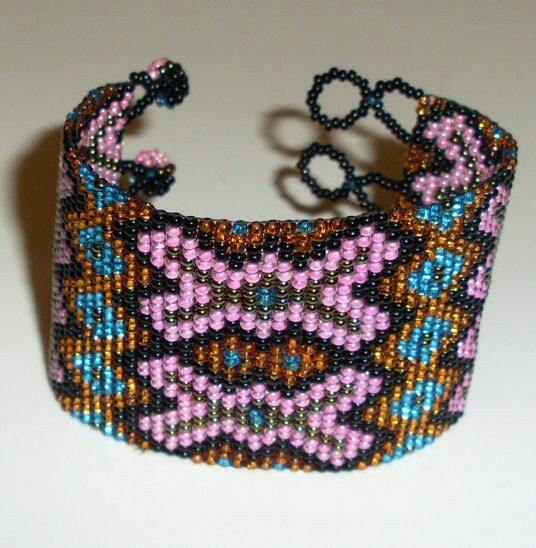 It is those that promote their work as Native American and are not that bother me and Etsy seems not to care. They continue to allow these sellers to break the law. I have yet to put together as serious marketing plan for my on-line businesses. I do post my items to my Face Book page but need to develop a business page there. I have a blog but don’t really use it as a piece of a marketing plan. I post things to my Flickr account and those seem to get picked up by Google often. I sell on Artfire as well as Etsy. I visits the Etsy forums frequently. I belong to two Etsy teams and one informal “team” on Etsy. On Artfire, I belong to two guilds. I can attribute sales to all of these endeavors but probably have not maximized their potential in that I haven’t sought “friends, fans, or followers”. I do pass out business cards at all of the events we participate in during the year. I also enclose one in each package that is shipped. What advice do you have for other Etsy sellers or those interested in starting on Etsy? My advice is to first think through what you want to call your store. As I said before, I joined Etsy as a buyer. When it asked me for a name, I didn’t give it a seconds thought. I used my first initial and last name. Since it can’t be changed, I am stuck with it. Now after having it for three years, I would be somewhat reluctant to change it even when or if I could. Secondly, don’t be afraid to promote your work once you get it listed. Take advantage of the forums and teams. Ask for help if you need it. The majority of Etsy sellers are kind and supportive. Overall, Etsy is a good place to showcase and sell one’s work but don’t think Etsy will sell it for you. Perhaps you will be lucky enough that it will sell itself…but that only works if you have a unique niche item in high demand. Most likely you will have to sell it yourself. Be prepared for on-line selling to take far more of your time than you ever dreamed it would. I am fast approaching my 300th sale on Etsy. Each time I get an e-mail stating an item has sold, I am just as excited as I was the first time. It still amazes me when out of the millions of pieces of jewelry on line, someone traveled through cyberspace, found my store and made a purchase! You can’t beat that kind of thrill. Go for it! 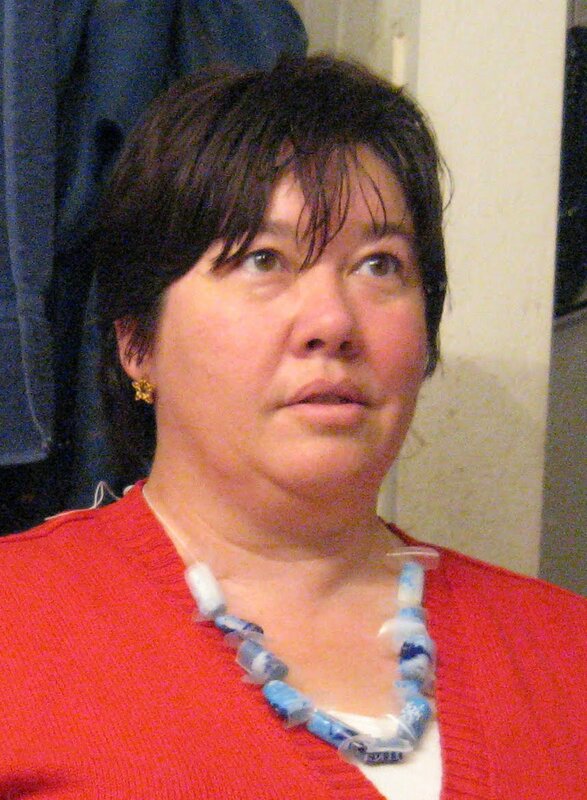 Joni is one of the threads who ties the Native American community together on Etsy. She keeps a thread going in the Promotions Forum where many Natives gather to promote their items, support each other, share stories and culture, etc. We don't have anywhere near the inventory in our shop that Joni does, but we have experienced the frustration of violations of federal laws regarding the selling of Native American items. There are countless listings that violate this, making it more difficult for those of us selling genuine Native American made items. I'm honored to have met Joni and learned so much from her. 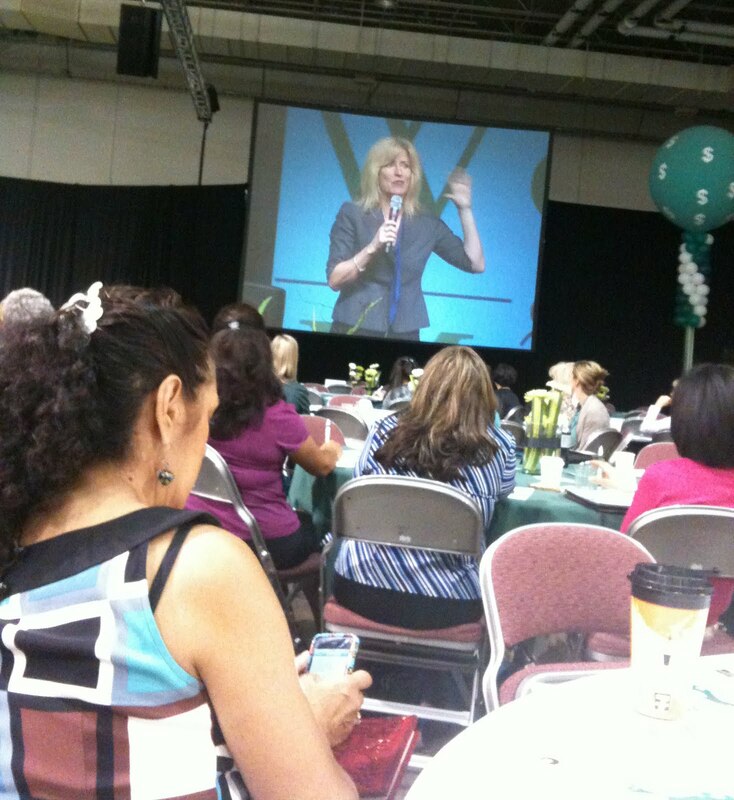 I attended a wonderful conference last week - "Smart Women Smart Money." It was offered at no charge and sponsored by Zion's Bank and other local sponsors. Since I have been planning to make our business official, I have been looking for help and information. One of the workshops at the conference was about small business planning and it was the main reason I went. Meeting other business women was the best part of the day. Other highlights of the day included hearing from Amanda Dickson, a local radio personality who has the sunniest personality you will ever encounter. The keynote speaker was Lee Woodruff. 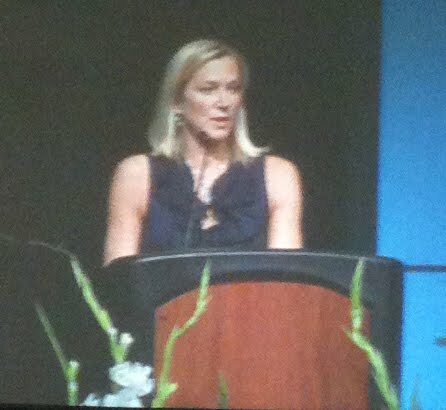 She spoke on how she dealt with her husband's major brain injury from an explosive devise in Iraq. She found herself with no clue about how their family's finances were at all. Fortunately, she had a small group of friends that came in and went through boxes and files to help her sort out the finances. "None of us knows what lies ahead, you have to live with the hand you're dealt." Once again, I snapped some pictures. 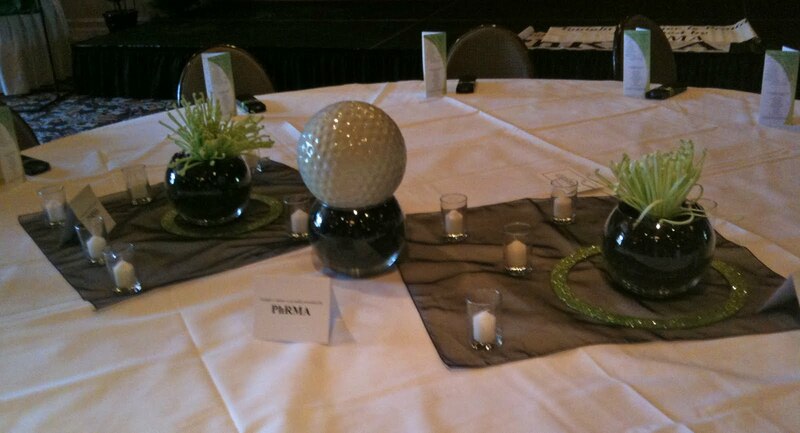 I liked the vases they had at the tables. Since they were such large tables, they paired two vases with different flowers, but kept them linked by having some long leaves bent into shapes and with the flowers poking through. 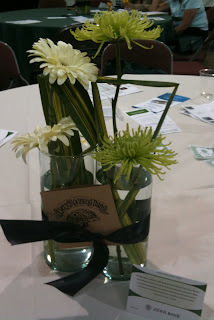 Ironically, the green, white, and black color scheme was the same as at the charity event earlier in the week and the green flowers in the arrangement were the "live" version of the artificial flowers that I had learned to shape for those other decorations. 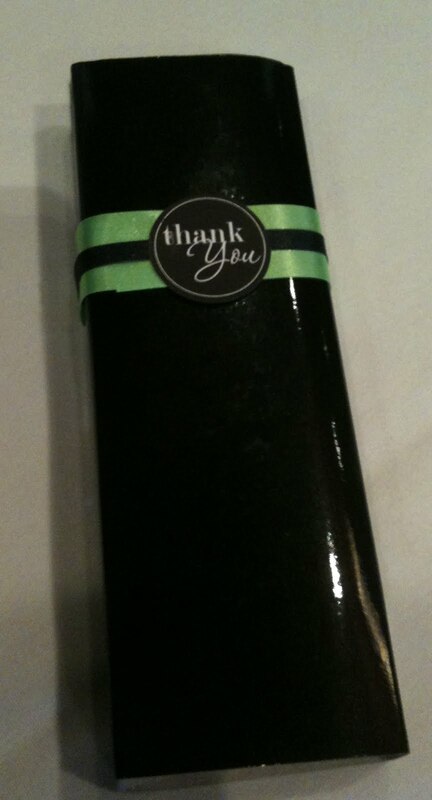 A black ribbon was tied around the two vases with a card acknowledging the donor. Participants at the conference got to take these vases home. I found several black ribbons left on the tables and now I'm working on some ideas for using them. I like this idea of not wasting anything! If you intend to do a floral arrangement like this, be aware that the leaves start to brown soon after being cut or punched through, so don't use it if you are making them ahead of time. I've been kind of absent from the blogosphere this week. With a couple of important events to attend, I found myself swamped catching up on the days in between. Fortunately, I've been trying to take pictures so I can share some ideas with you. My employer, Heritage Schools, Inc., received a grant from the Utah Families Foundation. 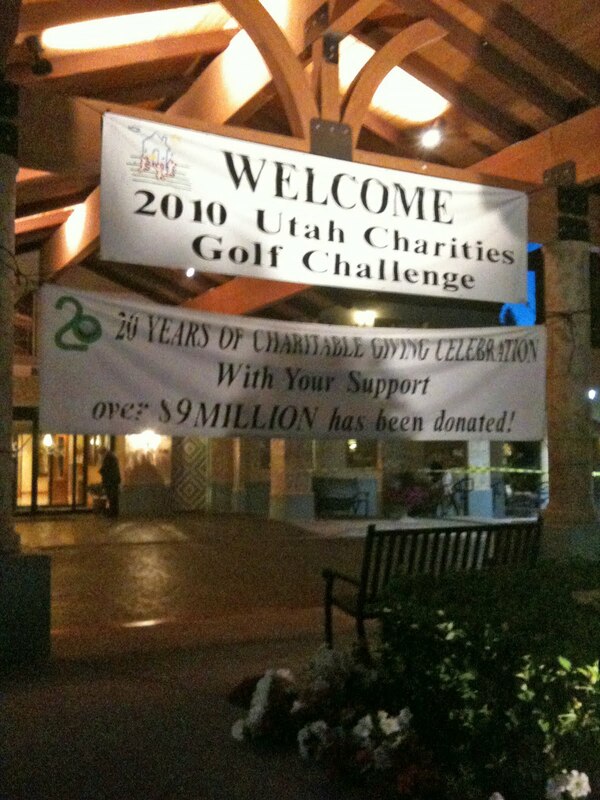 The money for this grant comes primarily from a golf tournament hosted by Senator Orrin Hatch. One of the requirements of receiving a grant is to provide volunteers to help with the event. I really enjoy attending events so I can see what they do, how they decorate, etc., so I was pretty happy that my boss asked me to attend. Although I was supposed to be working in the Hospitality Suite, I ended up being asked to help with setting up for the ladies' luncheon hosted by Mrs. Hatch and the awards dinner. Perfect!! By the way, my apron for working the Hospitality Suite matched the polka dot placemat you see in the photo. The theme centered around the 20th anniversary of the foundation and the event. By looking at the photos, you will see the colors black, white, and bright green as the color scheme. 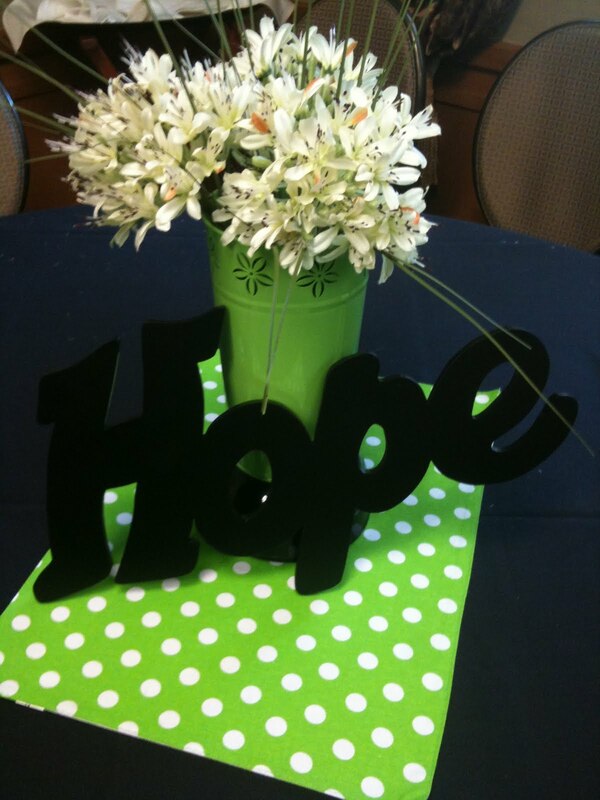 Wooden word cutouts (hope, love, believe), painted black, were used on previous nights of the event as well as in the hospitality suite. I wish I had a picture of what they had for centerpieces at the previous night's dinner. They filled round fish bowls with green apples and put the smaller word cutouts in front of them. For the awards dinner, the golf theme was obvious. 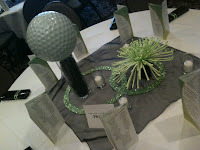 Tall vases filled with black paper shred had large golf balls sitting on top. The glittery green rings looked very pretty once they were on the tables despite looking very simple when we first pulled them out of the bags. I got to stick green artificial flowers in black foam blocks and got to be quite a pro at shaping them. Add some candles and the necessary literature, plus some gift boxes tied in coordinating ribbon (and a thank you sticker), and everything looked amazing. It was kind of refreshing to see that I wasn't the only one who had to deal with problems at an event. There were enough decorations for all the other tables, but not enough to do the same thing for the Senator's much larger table at the front. A very resourceful volunteer took some of the fish bowls from the previous night, stuffed them with black paper shred, and added the green artificial flowers for two of them and a golf ball for the third. 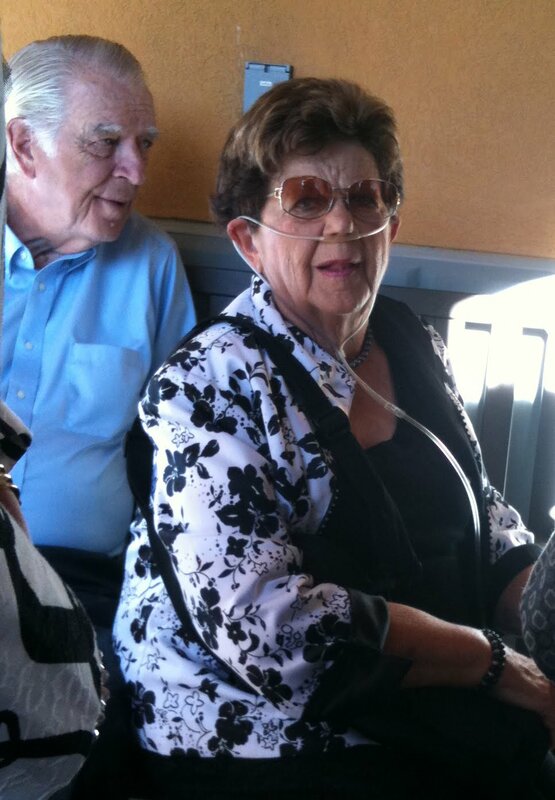 It looked very impressive and was probably better for conversation at that table. 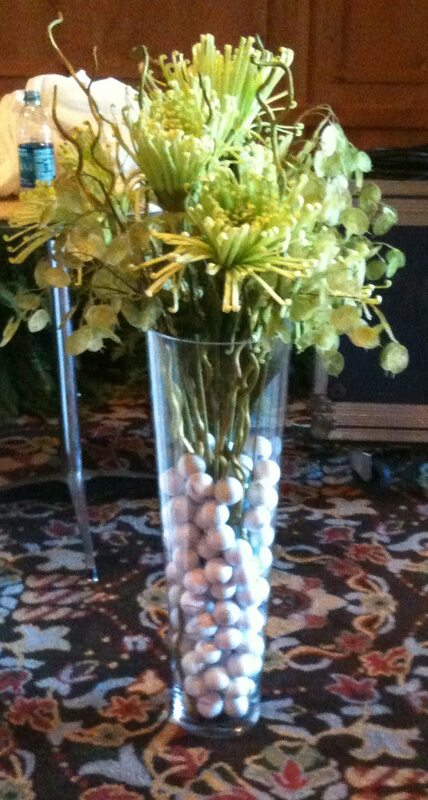 My absolute favorite decoration was the very tall floor vase filled with artificial flowers and branches and with golf balls instead of water. You might think it's weird that I take pictures of all this stuff, but I found out that other event organizers do it, too. Tricks of the trade, I guess. Senator Hatch often brings in his friends from the political and entertainment worlds. 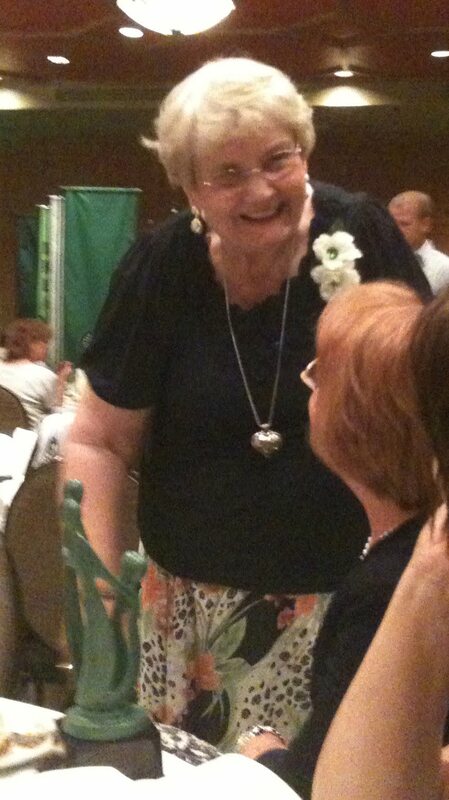 Utah's former governor (the first woman), Olene Walker, was there. 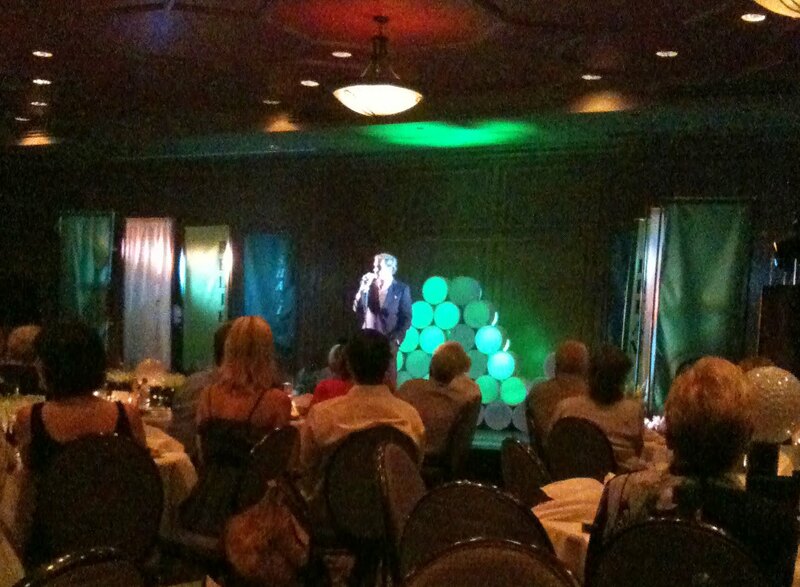 Michael Bolton was the entertainer for the awards dinner. Jason Hewlett and Thurl Bailey have also performed in the other years I have attended. 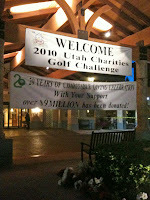 The Utah Families Foundation awarded grants to 71 Utah charities this year and we were pleased to be one of them. I cannot tell you how much I wish I had come up with that title! Craving Chocolate and Lazy Days is a very fun, but hard to categorize blog that I love to follow. Crissa, the author of this blog, was kind enough to let me interview her. Tell me a little about yourself and your blog. I am a 26 year old who is fairly new to the Mrs. world. I grew up in the Midwest but have been in Utah the last 11 years. My blog started off about me and my life. A journal type blog. I fell in love with product reviews and giveaways shortly after entering the blogosphere. My blog has morphed into my journal, reviews, giveaways, gossip, debates, and just plain fun! Crissa actually looks quite a bit like the figure in the banner for the blog. Her upbeat attitude and fun writing style were why I started following her. I started blogging in September 2008. After hearing about people doing personal blogs I loved the idea and thought I would give it a shot of my own. What is the focus/theme of your blog? It is a combination of my journal, reviews, giveaways, gossip, debates, and just plain fun! You know, girl stuff! One of the things I love about her reviews is that she is very honest about whether or not she is getting anything for doing the review. She often reviews great items she finds just because she likes them. This was the answer that surprised me the most since it seems rare anymore to find someone who doesn't sell ads for their blog. I have to agree that simpler blogs without the clutter of ads are much more fun to look at. Do you interact with your readers? I sure try to. I try to follow their blogs, make comments on their blogs, and reply when asked questions. I wish that there was more chit chat on my blog but I am still small and that will come with time I am sure. As a new blogger, I feel the same frustration. I have been frustrated at times with the lack of response to my questions and even to a giveaway, but it is getting a little better. Crissa follows 147 other blogs as well as keeping up with her own. Having missed nearly an entire week on my blog and trying to keep up with the ones I subscribe to, I can understand what she's going through. How do you come up with posts for your blogs? I just post about my life. I post what I am doing, what I am think, what I want, pictures, etc. Other posts come from reviews, giveaways, other things I have seen on blogs I follow, gossip I heard on Entertainment Tonight...just mostly life! What are your biggest frustrations with blogging? #2--Asking questions to my followers and not getting any response. What are the most fulfilling things about blogging? I love that I am keeping a journal, making friends, and having fun. It is a year hobby for me. I also love learning about new products and companies. This is a place my opinion can be heard. Crissa's goal for her blog is to have fun and keep friends and family up to date with her life. Her advice for beginning bloggers? Start with a dot com. It is better to start off where you want to be rather than try to get there later. Be yourself. Don't be afraid to share your life with others. I have to admit that it was Crissa who got me started in blogging (other than my personal blog for friends and family). Originally, I thought that blogs were just online journals that you could use to stay in touch with people long distance. Crissa shared with me the blogs she found with helpful hints, ways to save money, freebies, and giveaways and I was hooked! Craving Chocolate and Lazy Days is like a showcase of all the things you love about blogs and I hope you will visit and leave a comment for Crissa. Now that I'm in a crafty frame of mind, I want to make stuff out of everything I find. 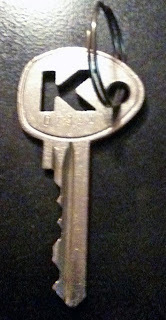 Over the weekend, I stumbled upon this key that was probably a spare car key left for us by a relative years ago just in case they locked themselves out. The cool thing is the "K" cut out of the key....my name is Karen....how perfect is that?! 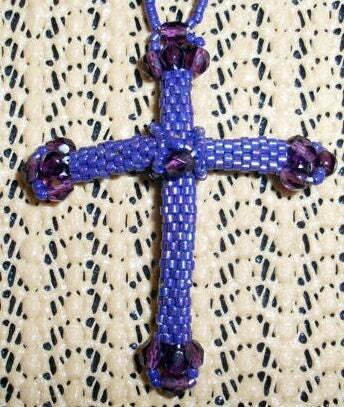 My first temptation was to make a beaded or tatted necklace to hang it from. Is that too boring? Shouldn't I try something new? What else can I do with it? I'm not opposed to a necklace as long as I try something different. I need your help to come up with some ideas to try, so bring them on. If I use your idea, I will send you something special that's handmade by me. I really should have done some Internet searches to see where the name popped up, but I didn't. Native Sky is all over the place and there's no way I could use it as a business name. It didn't take me long to dislike the name. It kind of grated on me and felt like wearing hot pink tourist moccasins to a powwow...eww! Figuring out a shop banner left me completely uninspired. It's posted here as a final farewell. You'll notice that I tried to incorporate the "sky" thing. The thing on the left of the banner is from a beadwork design. The thing on the right is some tatting. 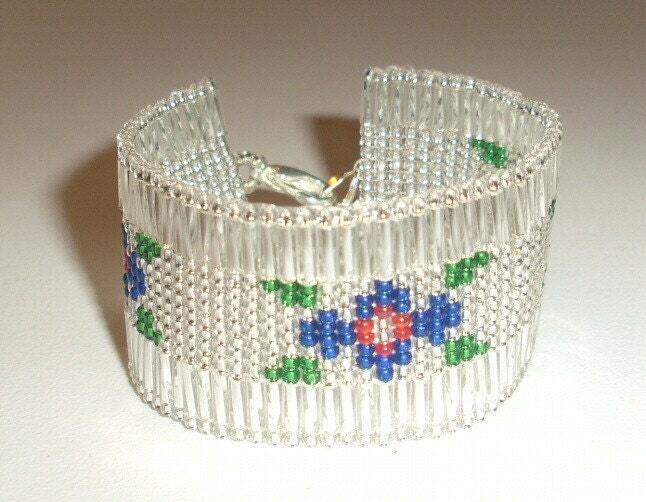 The shop name is filled with a beadwork design. I'm kind of embarrassed that I stuck with it for this long, but there was no sense in doing anything until I came up with a new name. Considered using my last name, but my brother-in-law uses the last name as part of his graphic design business and I don't want to confuse things. Decided not to reference any specific products since our shop is such a mixture. This has often been debated in Etsy's forums and some people establish separate shops for separate lines of products. What's in our shop is what we decide to make next and we prefer that to having to meet the demands of a particular product line. Searched for a way to incorporate my heritage as well. 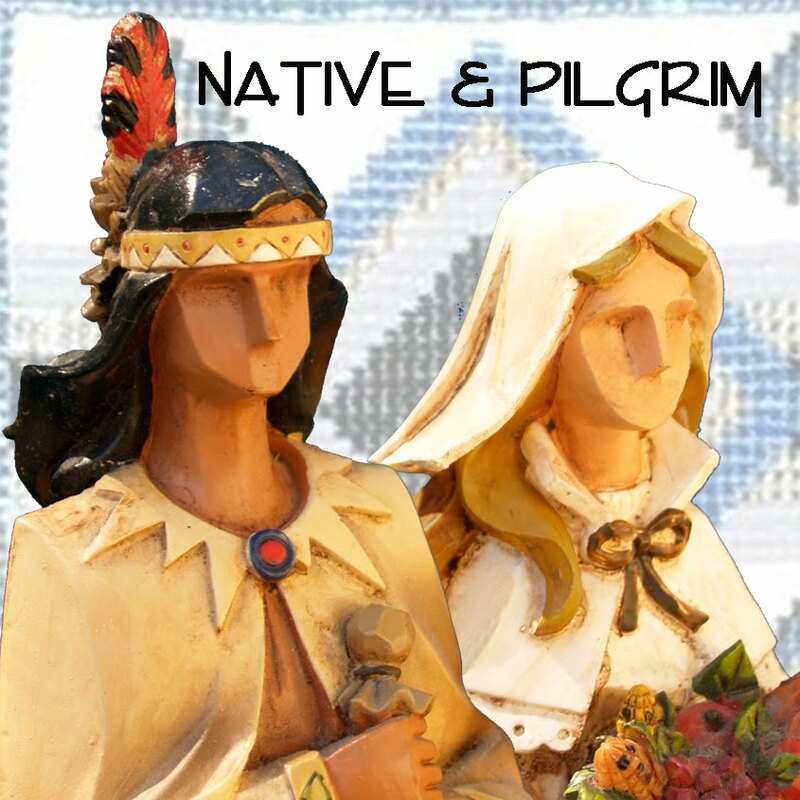 We may have a Native American household, but I am descended from Pilgrims. This actually makes my kids absolutely All-American - descended from Native Americans, Pilgrims, Immigrants, and Pioneers. When I decided on the name, I researched it online. Once I was satisfied that the name wasn't being used, I started working on designing the banner and avatar. I'd be happy to explain how I came up with the new banner if anyone's interested. I'm very happy with the results and feel like it really represents our shop well. Only time will tell if this was the right choice. I only hope Etsy will decide to allow for name changes in the near future. If you intend to start a shop on Etsy, make sure you do some careful thinking before picking a name. Just because it's available doesn't mean it's right for you. Now that I always travel with an "on the go" tatting kit, whenever my husband and I go somewhere, I manage to get at least a little tatting done. On our way to and from the Craft Lake City event Saturday, I tatted up some motifs from the Tatting Patterns and Designs book by Gun Blomqvist and Elwy Persson. They are Star #3 on page 47. I decided to have some fun and use green DMC thread for the shuttle and dark red Guterman thread for the chains. In the book, they are hanging like a heart shape, but I decided to turn them sideways to make some fun earrings. Since I just lost a beautiful beaded earring this weekend because only a single thread was on the earring hook and it managed to slip off, I added a couple of rings so these ones will stay on the earring hooks. 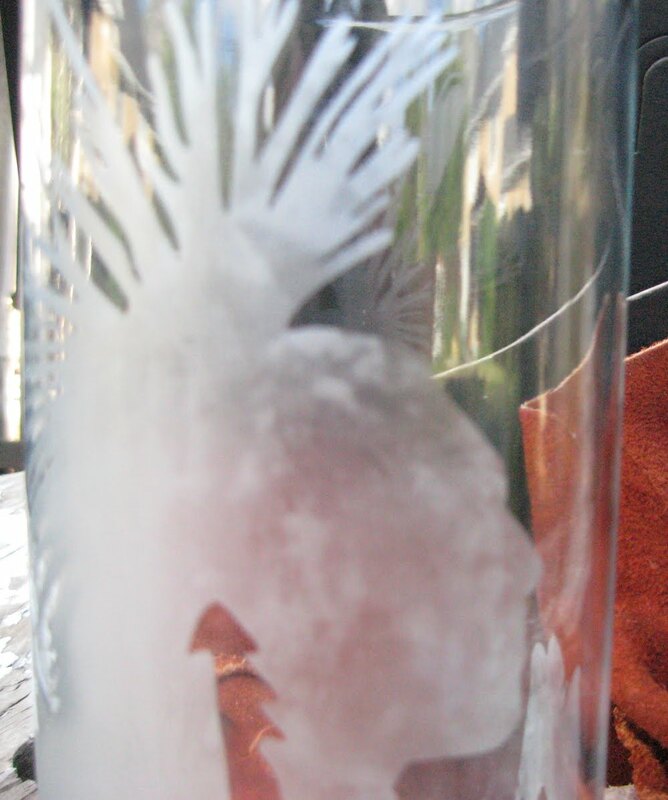 For the photos, they are hanging from an etched glass bowl. It may look like dust in the picture, but it's actually an etching of our last name. I've seen some really cute hair accessories online and at Saturday's festival. Several bloggers have done tutorials on making zipper roses and I thought I'd give it a shot. I actually ended up using both sides of the zipper so this flower would have a fuller look. It's not pretty enough to try to sell, but I planned on keeping this one for myself anyway. The upcycling trend really appeals to my frugal nature. Watch for some changes this week in my Etsy shop. Now that I'm determined to make a serious go of things, it's time to make some adjustments to the name of the shop and the look of the graphics.